HOWEVER enough about me! I want this post to be a thank you to you. Yes you, the loyal reader who comes here twice a week to read my rambles, often filled with cynical woe and over rational thinking. I cannot believe you have put up with me over this year. Every time you comment it fills my heart with warmth and makes me a giddy as a school girl all over again. For you who have Pinned my works, I cannot thank you enough too. It makes me feel so humbled that you believe my kitchen works are that good to pin. Some of them have even gone viral; this makes my brain spin about how many people like the stuff I do. I have to pinch myself every day to believe all of it. Also for all the comments about my Photography; I am deeply touched that you like them! I am not sure where my blog is heading but I will do my best every week to bring you recipes and a story. Sometimes I may not get it 100 precent right (please point it out if you find it!!) and I will work even harder to improve my recipe writing skills. So, what would you like to see me do here? Any ideas are welcome. Overall meaning of the post? Thank you for putting up with me, Belinda of “The moon blush baker”, for 367 days! I feel I need to deliver sometime special today for such an event. To prevent you from going out on unnecessary shopping trips this season I have a cupcake which is fun, rainbow and features a cheesecake. While most people have got into the red, green and white; I go the opposite in direction. My once brown and black baking gets hit of colour around Christmas; the summer season does that to me. The thing about cupcakes that bothers me the most is that people never eat the icing; they only like it because it looks pretty. Like many cupcakes before this I aim to make the topping or icing just as loved as the cupcake itself. If this means cooking up crazy topping ideas, so be it. I am sure you have seen that GIF of this cheese cake being made, so I will not go into details about that. However the rainbow strip design is very impressive for a minimal amount of work. Also this no bake cheese cake topper, so no worries about cracks! Who doesn’t like instant cheesy, sweet goodness? To make it more look like traditional birthday cake I used vanilla marshmallow butter cream and covered the sides in sprinkle. 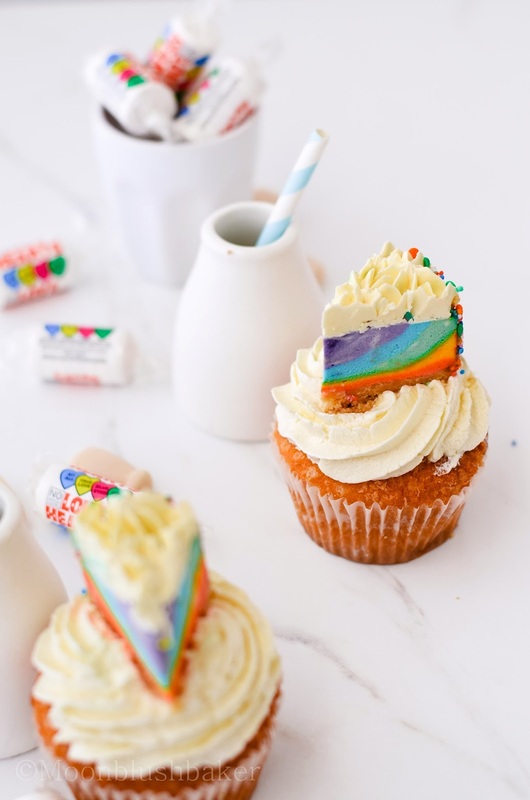 You may use whatever colours you like this cream cheese mix; you could even do an ombre topper! The base is my recipe for a yellow cake. The glorious yellow toned mixture from egg yolks bakes itself it to a delightfully buttery light but flavourful cupcake. I like to finish my cupcakes off with a bit of coarse sugar. 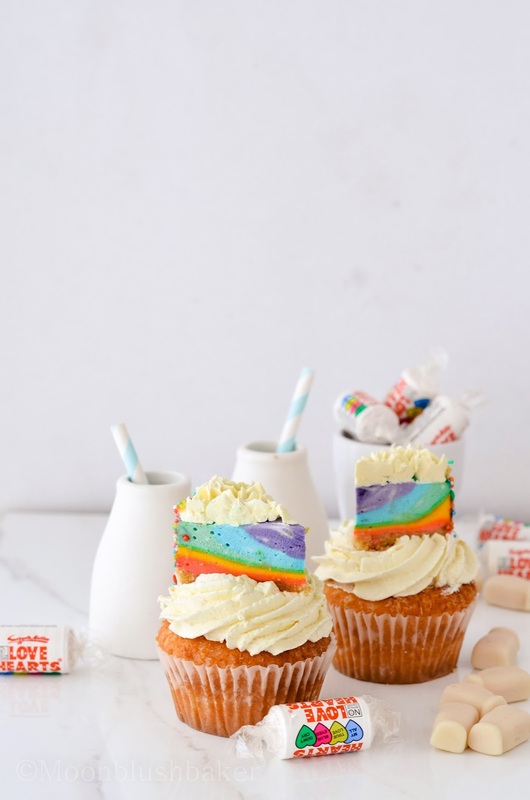 It helps create a light crunchy crust which means that you really do not have to do much to these cupcakes pretty. I finished it off with a bit of stabilised vanilla whipped cream, but if you want you could use butter cream or fluffy icing. 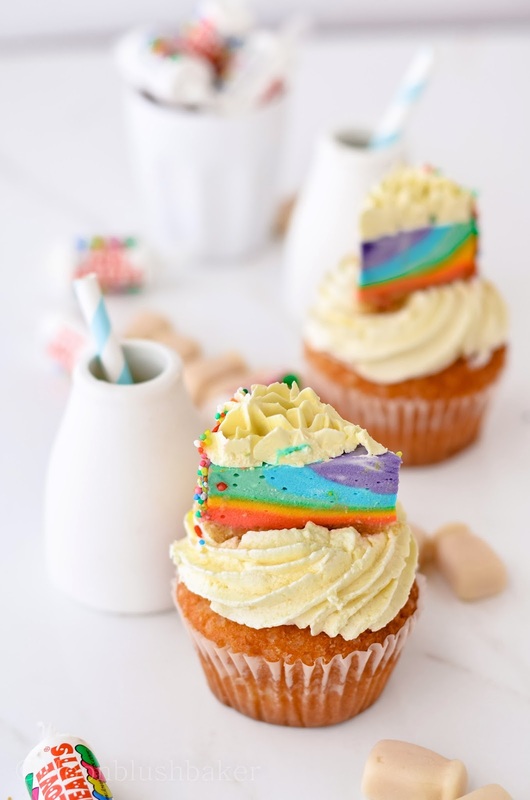 A tiny slice of rain bow cheese cake on a tender yellow cupcake with lots of vanilla whipped cream. These seriously fun and tasty dessert even adults can enjoy. During Christmas we can all use a little rainbow in your kitchen right? Preheat oven to 180C, line a muffin tin with cases. In stand mixer place, fitted with the paddle mixer, cream your butter and caster sugar for 5 minutes or until very light and fluffy. Add vanilla and salt, then beat on medium until fluffy again. Scrape down the bowl. Add egg yolks and beat for two minutes. Alternating between flour and milk, add these to the butter mixture. Combine until just mixed. Using ice cream scoop, fill your muffin pan half way. Sprinkle on raw sugar. Bake for 25-28 minutes or until a tooth pick comes clean. In a stand mixer beat your butter until it is pale and fluffy. About 10 minutes, then scraped down the bowl. Add your extract and marshmallow mixture. Beat until it is combined, it will be runny but you need to place it in the fridge later; so no panics. Add your icing sugar and beat until is well combined. Transfer to the fridge for 1 hour. 250g cream cheese, room temp. 150ml pure cream, Food colours or gels. Line and grease the bottom and sides of 2, 12cm spring form cake pans. Combined crushed sugar cookies and melted butter in a small bowl until combined. Press the cookie mixture into he bases of these two lined tins by using the back of a metal teaspoon. Place in fridge until needed. In a medium bowl, whip your cream to soft peaks. Set aside. In large bowl, mix your soft cream cheese, caster sugar and vanilla. Beat for 3 minutes until combined and fluffy. Add your gelatine and beat again. Fold 1/3 of the whipped cream in the cream cheese until combined. Fold the remaining whipped cream until just combined. Divide your cheese cake mix into 5 even qualities in small bowls. Dye each bowl a different colour, I used gel colours here but I think liquid will work too (10 ish drops?). Mix to combine. Take out your bases from the fridge. In your order of choice pour half of each colour mixture in to each lined tin. Allow to settle then pour the next colour in. Do not force the colour to set, simply tap the tin on the surface to quicken the movement. Continue to do this for each colour until you age used up all your cheese mix. Place in fridge for 4 hours or overnight. Once set, gently remove from spring foam tins. Place sprinkles on a baking tray. Holding the wide faces of the cheese cake, quickly but gently roll the sides of the cheese cakes in the sprinkles. Return to fridge for 1 hour. Make your butter cream. 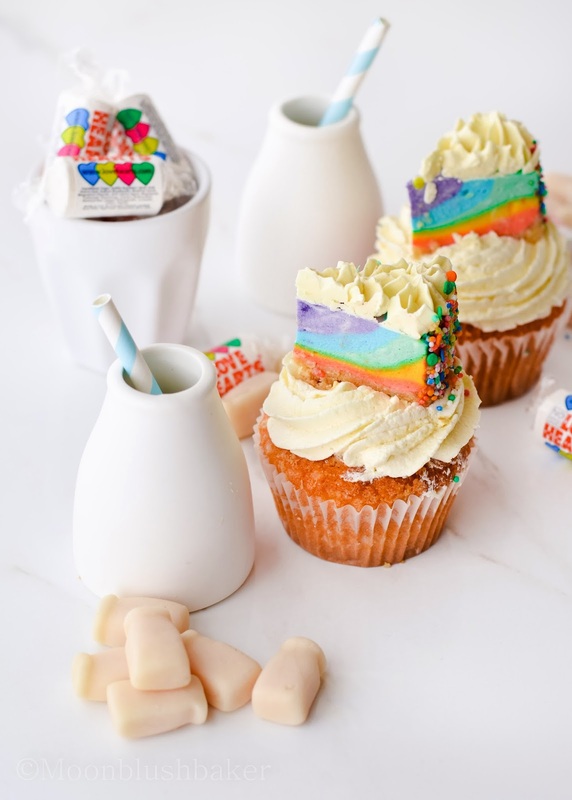 Using a piping bag of your choice pipe stars on top of the cheese cakes. 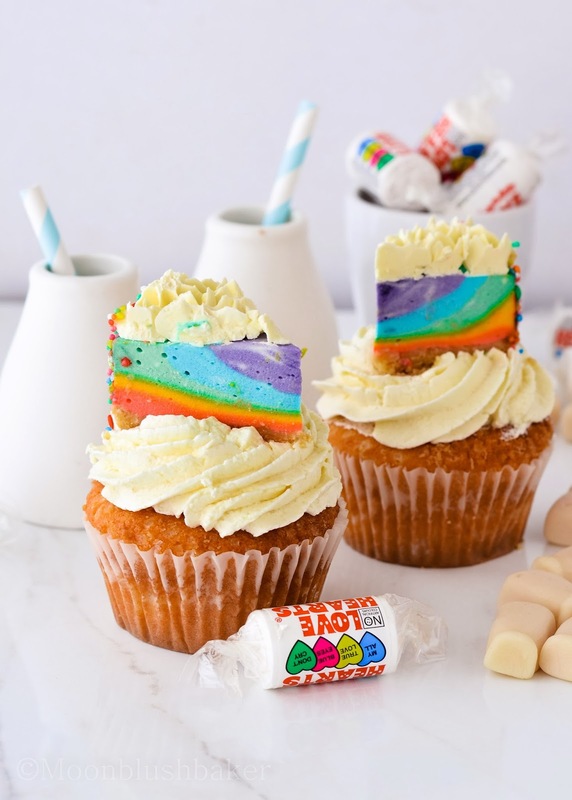 Pipe whipped cream on each cupcake with a medium star tip (about 1 cm). Cut each 12cm cheesecake into 8 slices. Carefully place the cheesecake on top of your iced cupcakes. Transfer to fridge for one hour to set. Serve on the day. Congrats on your blog birthday. These cheesecake topped cupcake look fab. Love the rainbow colours! Happy 1-year blogiversary! 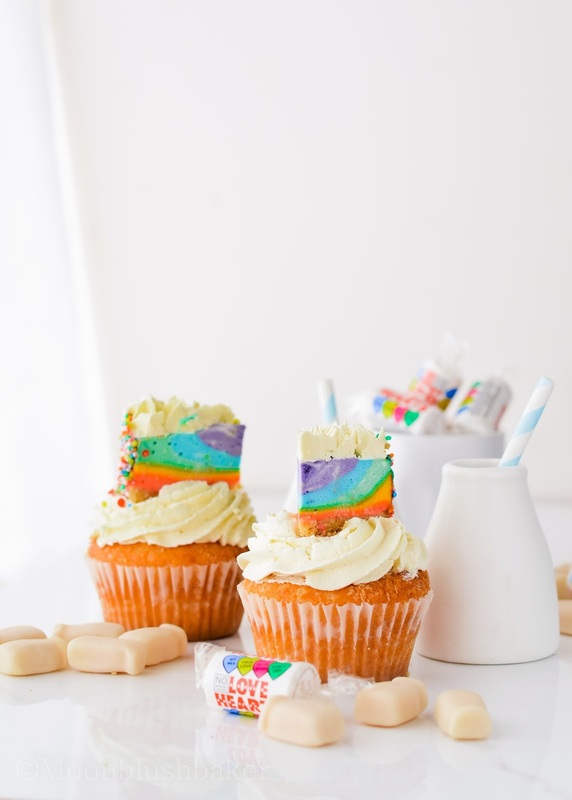 Your recipes never cease to amaze me-- these cupcakes look (and sound) incredible! Thanks Kailley, you are too kind. They super easy but look impressive eh? HAPPY BIRTHDAY!!! Amazing what you can pull off in just one year! I got a long way to go to be as good as you though! Those are so sweet!! Attention catching for sure. Thank you Teffy. It is the least I can do for my readers who take time out of their day to read my blog. Happy blogiversary, Belinda! These are just about the most adorable cupcakes I've ever seen. Thanks Steph! I can not believe I made it this far. Your comments always have been such a honor. Congrats on one year! Your desserts are amazing! I hope to continue the mini dessert trend. 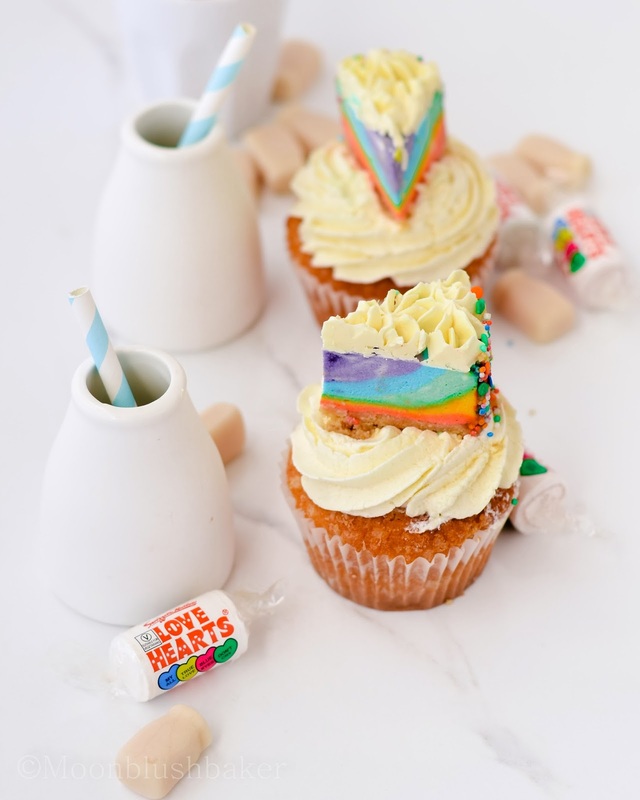 (Belated) congratulations on your blog anniversary :) Those little tiny rainbow cheesecakes are too cute! Hey Belinda..you doing such a great job..beautiful baking and even more beautiful pictures!! Which camera do use for your blog photography? Aditi, Thank you for such a wonderful comment. I use a DSLR Nikon D5100.